Writing is a big part of my workday and thus a big contributor to my paycheck. While I'm not exactly toiling over the next season of the supremely clever Dexter, I do appreciate getting a fair amount of $$ for my work. Members of the Writers Guild of America have been on strike since last November as they seek more equitable compensation, which they absolutely deserve. Today's fallout from the strike includes the Golden Globes, reduced to an hour-long news conference which I think might be kind of interesting anyway. No witty banter, no red carpet, no glitzy gowns. How will they fill the time? 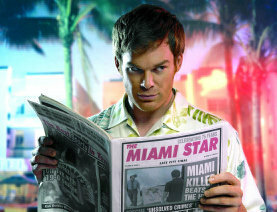 By the way, if Michael C. Hall doesn't win a Golden Globe for Best Performance by an Actor, I'll be beyond ticked.